Happy Valentine’s Day Everyone! This is an interesting time of year where the question of love and companionship are on the tip of everyone’s tongue. Seems like most people are in a mad rush to see if they can find a Valentine to share the holiday with. Many who don’t have a Valentine question their self-worth and wonder what’s wrong with them. This is a day I wish Happy Valentines Day to me. No matter what, I’m going to spend the rest of my life with me! Pretty obvious, right? But what did that mean? It meant that I should be the kind of person I like spending all my time with. I mean, isn’t that what a relationship is all about? Finding someone you can love and trust and enjoy their company just about all the time? The problem with dating is that we are usually seeking someone to fill the loneliness within. But what is that loneliness? A need to be loved. A need to be wanted. A need to be validated. We humans have these needs and to be quite honest it is pretty damn difficult to get those needs fulfilled. People can be pretty harsh and unforgiving. When we open ourselves up and make ourselves vulnerable to others, we frequently get hurt. Not only is it hard to find another person to love, want and validate us, it’s an empty pursuit. If we luck out enough to find someone who loves, wants and validates us enough, if things don’t work out in the end, the gap within us is still there. We have to find someone else to fill the gap. 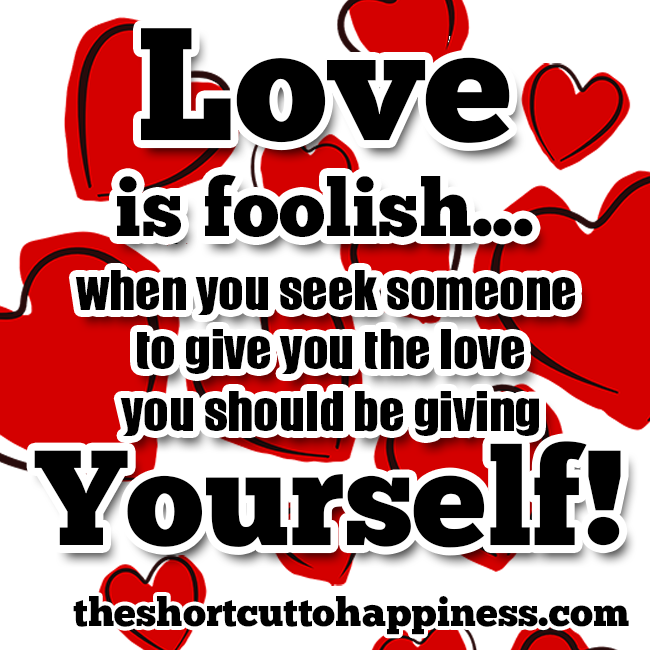 Some say love is foolish — this is why — because we seek someone to give us the love that we should ultimately be giving to ourselves. Wise love is the love we give to ourselves. This Valentine’s Day I petition you to love yourself. If you love yourself by loving the special someone in your life, awesome. If you’re single, be your own Valentine. Make a pact with yourself to be exactly the kind of person you want to spend all your time with. Love yourself. Validate yourself. Want yourself. Encourage yourself. Speaking kindly and compassionately to yourself. Make wise decisions for yourself. Be the kind of person you can trust and confide in. In the meantime, you will become the person that your ideal mate would want to be with. Not that this statement is a promise that you’ll find someone to spend your life with, except that it is. If you love yourself you will be happy. If you love yourself completely you will find someone you want to spend your life with — YOU! The relationship you have with yourself is the most important one there is, so make it a great one. Now, I have a bottle of white wine and a bucket of chocolate-peanut butter ice cream waiting for me. Happy Valentines Day to me AND you! Go enjoy your Valentine’s Day. No matter what. Spread the love! This entry was posted in How To Be Happy and tagged happy valentines day, happy valentines day to me, happy valentines to me, how to love yourself, love is foolish. Bookmark the permalink.